Back in 2012, we started exploring how patterns in the magnitude and persistence of fluctuations in instrumental records of temperature and their major global sea and land indices might have changed during the last century. Our objective was to identify regions where climate variability and autocorrelation might have markedly increased potentially due to anthropogenic forcing. 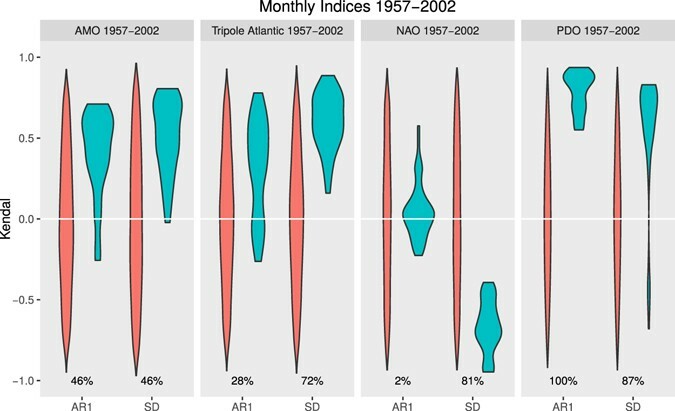 We just published the results of this work in a paper titled Observed trends in the magnitude and persistence of monthly temperature variability. The main findings are summarised here. This entry was posted in Uncategorized on July 24, 2017 by vdakos. Just a week before the resilience conference 2014 in Montpellier a short brochure of our forthcoming book on “Principles for Building Resilience: Sustaining Ecosystem Services in Social-Ecological Systems” (Cambridge University Press, 2014) has become available by the Stockholm Resilience Center. The brochure summarizes the expanded treatment of resilience principles as we have discussed in an earlier paper “Towards principles for enhancing the resilience of ecosystem services“. This entry was posted in latest news, Uncategorized and tagged book, conferences on April 22, 2014 by vdakos.